I rushed to the bus to New York yesterday because I didn’t want to be late for my matinee of The Motherf**ker With the Hat. I was in the mood for some laughs, and the show will probably close soon, so there was reason to get in gear and go. I made it in time, got my seat in the center of the back row (it’s not a huge theater) and could tell from the set I was in for a great ride. I expected some comic turns by the always irreverent Chris Rock, maybe a stand-up type routine or two tied together with a loose plot and a lot of people running back and forth. The play wasn’t like that at all. It began with a long telephone monologue by the extremely funny and hip Elizabeth Rodriguez. She’s playing a pretty if scruffy young woman talking on the phone to her mother and acting very much as if she is the mother herself. By the end of the speech she’s done a line of cocaine and had the audience howling with laughter. Her boyfriend enters, played magnificently by Bobby Cannavale, upbeat (for the only time in the play) and bragging about having landed a job. They are going to celebrate any minute—until he sees an unidentified man’s hat on a table in the room and everything in both their worlds changes forever. The set does the first of its own dances now, revolving, looping, furniture folding down into the floor and up from another part of the floor. We are in a different setting where our hero is consulting with his AA sponsor, who is played very suavely by Chris Rock. I was delighted to see an AA element effectively worked into the play, neither as the crux of the script nor its deus ex machina. Just a fact of life. Like it or not. I for one love the 12-Step programs. Other characters come in, other sets, and as the play moves on we cannot wait to see what happens next. It’s so expertly written that the viewer doesn’t think of it as a string of long monologues woven together to tell a story, which, on one level, it is. The use of profanity is essential—this script elevates street language to poetry and raises the mundane, tawdry situations of everyday life of flawed, dirty, confused people to classical heights. It was a wondrous experience in the theater. When I first lived in New York in the mid-1960s, the theater was thought to be pretty much a dying elephant in the city. Plays were old-fashioned and the best actors had gone on to be movie stars. I have an announcement to make. Great theater has made a roaring comeback, and it is not going away. If what I’ve seen in the last 12 months is any indication, there is still a need to explore our psyches and souls in this way. The playhouse was full, and not only with us greybeards either. There were all kinds of people in that audience, with all kinds of hair, from dreadlocks to perms and literally every color of the rainbow. Plays like this speak to a vital and dynamic audience, with a voice even we old-timers appreciate. I admit some of the rapid-fire dialogue went past me, but I was transfixed from the get-go. Was it a star turn for Chris Rock? Not so much as it was an excellent vehicle to show him as an actor rather than just an insult comic, and he acquitted himself superbly. 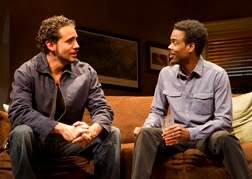 More than that, it was a production that grew out of love, from a theater company of actors who have worked together for years, from the Public Theater to Broadway—a playwright, Stephen Adly Guirgis, who wrote from his own heart for actors he knew; and a director, Anna D. Shapiro, who approached the material with simplicity and vigor. Even the scenery by Todd Rosenthal whirled about sleekly and seamlessly, and appeared to be a participant in the drama and comedy of these lives. It was an ensemble of equals, including Yul Vazquez in an ambiguous role of a light-in-his-loafers cousin balancing the volatile nature of the Cannavale macho man; and Annabella Sciorra, who radiated rage and tenderness as the broken-hearted ball-buster wife of the AA sponsor. There is much in this play that keeps us on the edge of our seats. Our hearts are touched, we laugh, we are astonished. What more can we ask of live theater?